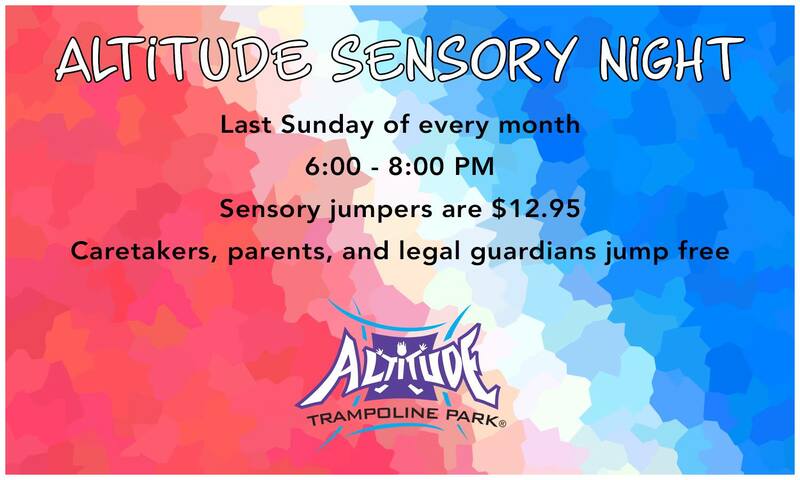 Visit Altitude Trampoline Park on the last Sunday of every month for their Altitude Sensory Night! Music will be turned off, lights will be toned down, and the environment made sensory friendly. It is $12.95 for the 2 hours of jump. Plus an additional $2.00 if you do not have the required Altitude Safety Socks. Parents/caretakers/legal guardians jump for free! Please note that the park will be closed to the general public so that sensitive friendly jumpers feel more comfortable. This will be enforced. Thank you for your understanding!